Abu Dhabi : The Prime Minister of India Narendra Modi on Monday held a meeting with Crown Prince of Abu Dhabi Sheikh Mohammad bin Zayed Al Nahyan. This is the first visit by an Indian prime minister to the United Arab Emirates, home to around 2.6 million expatriate Indians, in 34 years. “A formal tete-a-tete. 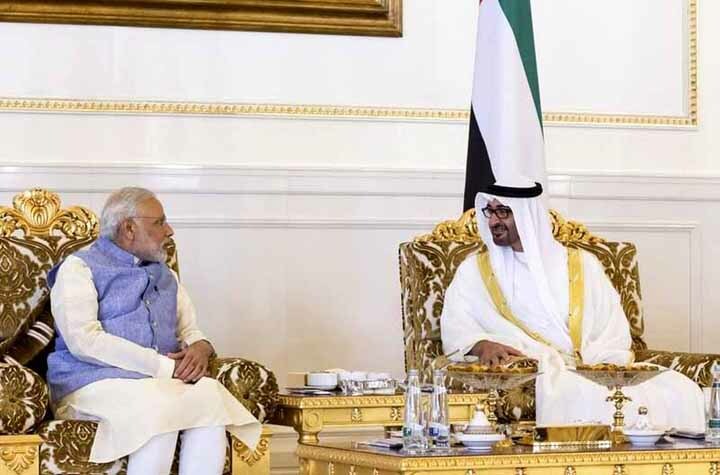 After the warm reception at the airport, HH Sheikh Mohd bin Zayed Al Nahyan & PM talk business,” tweeted Vikas Swarup, spokesperson of the external affairs ministry. On Sunday, the crown prince broke protocol to personally welcome Modi at the Abu Dhabi airport. Earlier in the day, Modi took a tour of Masdar City, a hub of clean technology. Following this, he addressed an investors’ meet and urged UAE businesses to invest in India. Modi is on a two-day day visit to the UAE.